Content: There’s really nothing objectionable for the target audience, though there are letters written in cursive, and I know my 3-5 graders would have problems deciphering those. There’s also several intense situations, so if you have a sensitive child, you might want to shy away from that. Dorothy and Wolfgang Revel — they go by Dodo and Wolfie, however — are children in London the winter of 1940 when the German bombs start dropping. Their father is called up to serve in the army — he was a celebrated commander during World War I — and they are sent off to Northern England to live with strangers. They’re doing okay, until word comes back that their father was arrested for desertion. Then, they are outcasts in this strange place. That is, until they’re taken in by the school teacher. Whereupon Wolfie chances across a horse being born and adopts it for his own. If you can’t tell my my enthusiastic summary of the first 50 pages (which is really all that is; this book covers an enormous amount of time), I am not a horse person. And, alas, this book did nothing to help with that. I kind of had hopes that this would be Inspiring and Uplifting and help me see what people find in horse books, but… no. I was bored. 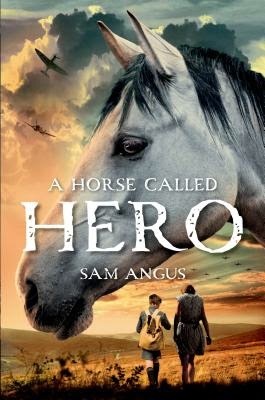 The basic plot revolves around Wolfie’s love for Hero The Horse and the kids’ concern about their father. There was an incident when Hero saved them after they got trapped in the bog, and another when Hero helped Wolfie get out of a mine after an explosion, but by then, I was so Bored because of the lack of Real Plot (and the extended time; Wolfie was 5 or so when it started, and 14 by the end), I was just skimming. I am sure that there are kids who would Love this one, but I am not one of them.